Pushpa Viswanathan, K. Raghunath, Urmila Majhi, Rajani V. Pandit, G. Shanthi, T. Rajkumar. Emperipolesis - an electron microscopic characteristic in RDD (Rosai - Dorfman disease) - A case report. Ind J Med Paed Oncol 1997; 18: 14-16. Anita Chandra, R.K. Baruah, T.G. Sagar, Pushpa Viswanathan, S.G.Ramanan. Primary intratesticular sarcoma. Ind J Med Sci 2001; 55(8): 421-28. Pushpa Viswanathan, Sumathi K. Balaji and Malathi N. Ultrastructural studies on muscle fibres in oral submucous fibrosis. Proceedings of the 28th Annual Conference of the Indian Association of Biomedical Scientists, 2007. Stromal changes in apparently normal mucosa of smokers and pan chewers - a multi-parametric approach. R. Karthikeyan; Basireddy Sivareddy; Herald J. Sherlin; Anuja N; Pratibha Ramani; T.Chandrasekar; S.Ganesan and Pushpa Viswanathan . Brazilian J. Oral Sciences, 7 (26), 1602-1608, 2008. Mechanism of bactericidal activity of silver nitrate - a concentration dependent bifunctional molecule. S. Ramkumar Pandian; V. Deepak; K. Kalishwarlal; Pushpa Viswanathan, Sangiliyandi Gurunathan. Brazilian J. Microbiology. 41, 805-809, 2010. 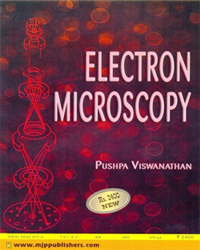 Book entitled "ELECTRON MICROSCOPY' authored by Pushpa Viswanthan and published by M/s MJP Publishers, Chennai published in August 2011. This book running to 530 pages including Glossary, References and Index covers most of the relevant topics in this field for the users. The contents are divided into 4 parts, namely, Instrumentation, Specimen Preparation techniques, Applications of TEM in various fields including tumor diagnosis and Recent Advances. Around 400 illustrations, mainly in the Applications part, are included, more than 90% of which are taken with our Transmission Electron Microscope at Cancer Institute with a view to introduce and familiarize the students and scholars to the ultrastructural features of different kinds of specimens. Thus, this book, the first of its kind in India, is intended to create "a feel for this subject", particularly among those who want to use this technique for their research work. Krishna Murti, C.R. and Pushpa Viswanathan. Eds. Toxic Metals in the Indian Environment. Tata McGraw Hill Publishing Co. Ltd, New Delhi, 1991.